This weekend the streets of Belle Isle will reverberate with the roar of Formula One race cars as Detroit hosts the 2012 Grand Prix. In preparation of the event, Belle Isle has been getting a much-needed makeover. Located in the middle of the Detroit River on Detroit’s near east side, approximately 2 miles upstream from Downtown, Belle Isle has served Detroiters as an urban recreational oasis for over 125 years. The island is approximately 2 and 1/2 miles in length, 1/2 mile in width and about 1000 acres in size. Over the years Belle Isle has been the center of various outdoor events, drawing huge crowds particularly for the 2007 Grand Prix and the annual thunderboat races. But the primary purpose of the island was to provide a natural escape for relaxation and recreation for the city dwellers of this major industrial metropolis. It was with that purpose in mind that the city purchased Belle Isle in 1879 for $200,000, and commissioned Frederick Law Olmsted, a prominent landscape architect, to oversee its design and development. The island was not known by its current name until the mid-1800s. The first non-native settlers to the area, the French, called the island “Isle aux Cochons”, which meant “Hog Island”. It is that name that appears on the deed, dated May 15, 1769, that transferred the ownership of the island from the Ottawa and Chippewa Native American tribes to the British commander, Lieutenant George McDougall. Over the next 100 years the deed would pass through several private hands, the last being Barnabas Campau (whose second wife, Archange, was the granddaughter of George McDougall). The oldest building on the island is The Whitehouse, which Archange had built in 1863 after remarry following Campau’s death. Today the house, which was renovated in 1984 by the Friends of Belle Isle, houses the official offices of the park. When the park was opened to the public in 1882, the only access to the island was via a ferry boat. Large ferry boats left the docks at the foot of Woodward Avenue in Downtown Detroit, while smaller ferry boats crossed from docks located at the foot of Joseph Campau Street (near present day Chene Park) on Detroit’s near east side. In 1889, the city built a narrow steel swing bridge at the waterfront near E. Grand Boulevard to accommodate horse and buggy, phaetons (a horse-drawn carriage bus), and later cars and buses. By 1906, an amusement park, Electric Park (also sometimes referred to as Riverside Park), would occupy the land on both sides of the bridge between Jefferson Avenue and the waterfront. But on April 27, 1915, the swing bridge, which had wooden planks for its road surface, caught on fire and was destroyed beyond repair. To accommodate traffic, a temporary bridge was quickly erected, which required the demolition of part of Electric Park. The new Belle Isle Bridge, which still exists today, was opened to traffic on November 1, 1923. First named for George Washington, it would later be renamed for General Douglas MacArthur. Even when the park was finally opened to the public in 1882, it was far from complete. Only the area near the western tip where the ferries docked was available for public use. It would take almost 15 years to complete all the infrastructure of the island, including filling marshy areas, constructing canals and lakes, building roads and bridges over the internal waterways, and erecting buildings necessary to the recreational needs of the public. Although the driving purpose of developing Belle Isle was for the recreational needs of Detroiters, in the early years it was really an escape from the city by the affluent of the community. Photographs of those early years from 1882 to 1910 taken on the island and at the ferry docks overwhelmingly show men, women and children dressed in higher society fashions. The lower working class families did not have the means to pay the cost of transportation to get to the island, so I doubt that my great-grandparents and their families had an opportunity to utilize the park until the early 1900s. 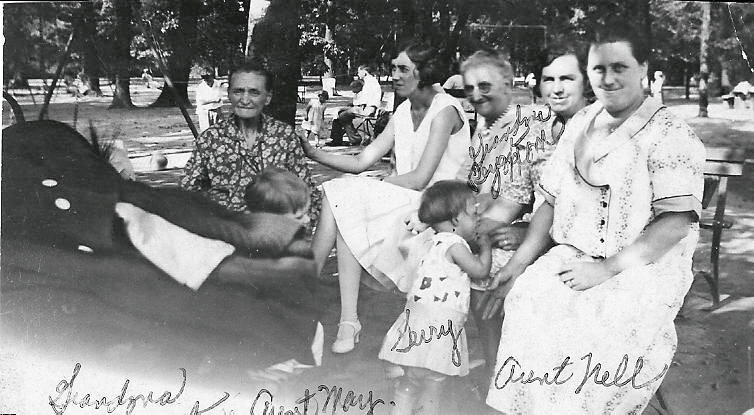 However, shortly after the opening of the new bridge, Belle Isle would finally be the park for all Detroiters, regardless of social-economic class, as can be seen by this family photo of the Reyst and Smouter members enjoying a sunny summer day at a picnic area on Belle Isle around 1930. My mother recalls my grandparents, Cornelius and Jennie Smouter, often taking my older sister as a toddler in the early 1940s to Belle Isle on Sunday afternoons after church just to drive and walk around the island. The island was accessible all year round and offered diverse activities such as swimming, boating, canoeing, rowing, fishing, nature trail hiking, horseback riding, baseball, softball, tennis, even concerts. But summer was not the only time to visit the island. Ice skating on Lake Takoma was very popular. As a child, my father and uncle would take my cousins and I to ice skate there. I was never very good at it (guess I never was blessed with that important Dutch gene), but the best part was the hot chocolate afterwards at the Flynn Skating Pavilion. Use of the island by Detroiters hit its heyday in the mid-1900s, peaking around the 1930s. Today one can still see remnants of those glory days – the Detroit Yacht Club, the Detroit Boat Club (where Johnny Weismuller, better known for his portrayal of Tarzan, would qualify in the club’s Olympic-sized pool for the 1928 Olympics in which he won a gold medal), the Children’s Zoo (now closed due to the city’s budget issues – home to the Detroit Zoo before its move to Royal Oak), the Aquarium (also now closed due to budget constraints), the Anna Scripps Whitcomb Conservatory (which has one of the largest collection of orchids), the Casino (designed by Albert Kahn which housed a ballroom and restaurants), the James Scott Memorial Fountain (made with more than 10 tons of marble and includes Pewabic Pottery – there is also quite a story about how it came to be on the island), and the Dossin Great Lakes Museum (where you can see the Gold Cup winning “Miss Pepsi” powerboat). Throughout its 130-year history, Belle Isle has always been free to all who wish to visit. But sadly that era may be coming to a close with the city’s dire financial woes. Recently, there has been much discussion about the State of Michigan Parks Department taking over administration and maintenance of the park – within the next 5 years if that occurs a new structure will appear at the entrance of Belle Isle, an admission gate.